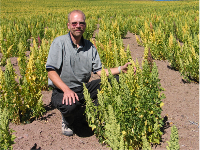 The USDA National Institute of Food and Agriculture in partnership with Washington State University are pleased to announce the upcoming International Quinoa Research Symposium. Researchers from around the world will be hosted by Washington State University in Pullman, Washington. The symposium will include hands-on demonstrations at area field trials, current research, and will coincide with the United Nations, International Year of the Quinoa (IYQ). The objective of the IYQ plan is to focus world's attention to the roles that quinoa's biodiversity and nutritional value play in providing food security and nutrition, in order to support the internationally agreed upon development goals of the eradication of poverty.